One of my first memories as a running couple is when we got Gabe fitted for shoes. We were at Fit2Run in Tampa and the guy helping us out mentioned a race where Zombies chased you and tried to "take your lives". As we are both huge fans of The Walking Dead, we instantly went home and researched this so race and found ourselves on a website for the zombie run called Run For Your Lives. Gabe is a good sport and will run pretty much any race I ask him to do (although he drew the line at Princess). He only asked one thing in return, that we do Run For Your Lives. In 2012, I agreed to do this with him but we ended up having family in town that weekend and couldn't make it. Fast forward to today - Run For Your Lives, the original zombie 5K, has invited me to be a brand ambassador on their Zombie Preparedness Team. You can take full advantage of my relationship with Run For Your Lives and receive 15% registration with the code ZPTD2 (nearly $15 off!) which can be used for any Run For Your Lives races throughout the US! If you are in Tampa or Central Florida and use the Run For Your Lives discount code, you can run the race as part of my team on November 16th! We will be in the 10:30am Central Florida Run For Your Lives wave and hope to see you there! As part of the Zombie Protection Team, I will share tips on training for a zombie attack, how to dress for the race (blending in with Zombies is a good thing!) and how protect yourselves from zombies while on the course. I will use my partnership with Run For Your Lives to figure out where the zombie clowns are so I can keep far away as humanly possible from that area. There will also be a few giveaways in the future! Make sure you subscribe to my RSS so you wont miss out on that! 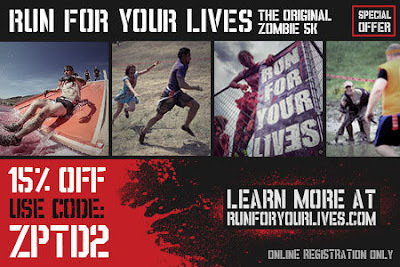 Would you run a Zombie infested race? Let me know why or why not!